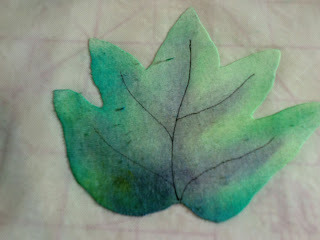 Quilt Whimsy: Coloring Fabric with Melted Crayons. . .
Coloring Fabric with Melted Crayons. . .
Our art quilt workshop on Tuesday was about playing with melted crayons to color fabric. 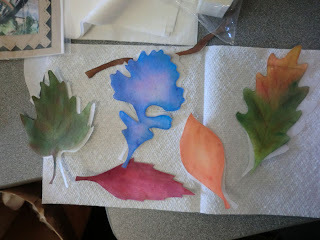 I thought I would go over the process with you and share photos of students' completed colored applique shapes. 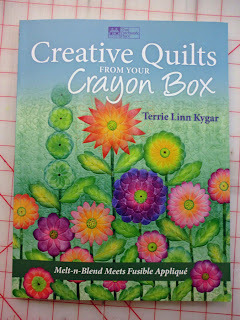 Let me begin by talking about the book from where our technique was taken: "The Creative Quilts from your Crayon Box" by Terrie Linn Kygar. The book describes the technique well and the specific supplies needed. 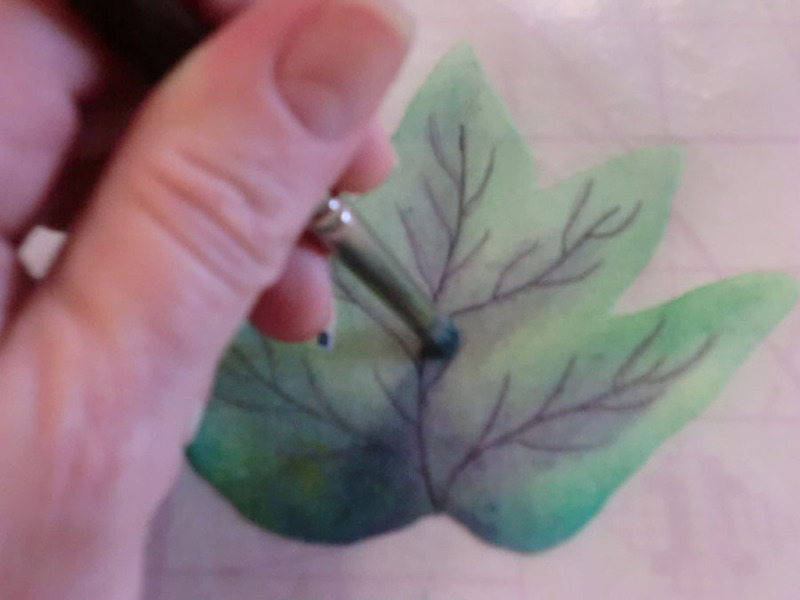 The author does a good job of demonstrating the possible pitfalls you may run into while trying to paint with the melted crayon and how to correct them. 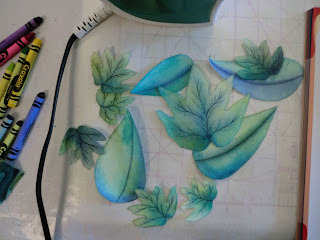 Please visit this link to see a video of the process. 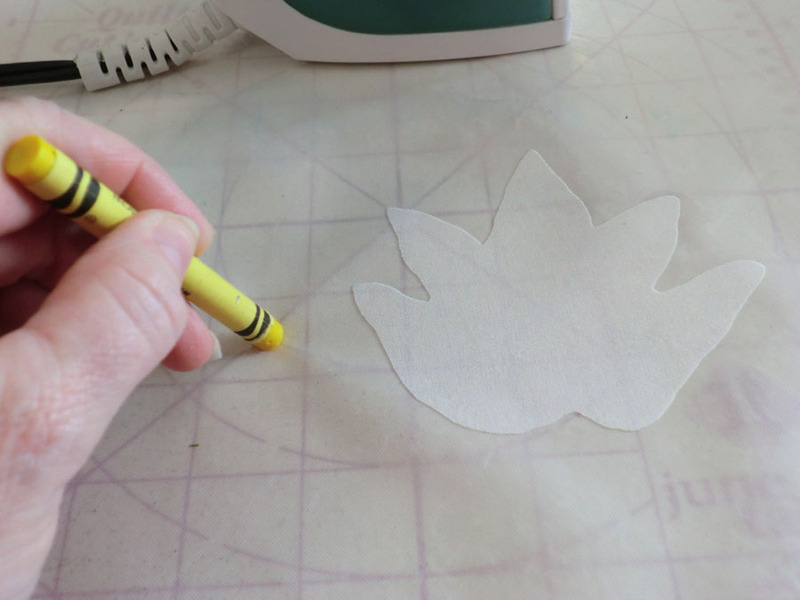 Let's begin by making our "paintbrush" from a paper napkin. The author recommends Bounty paper napkins. 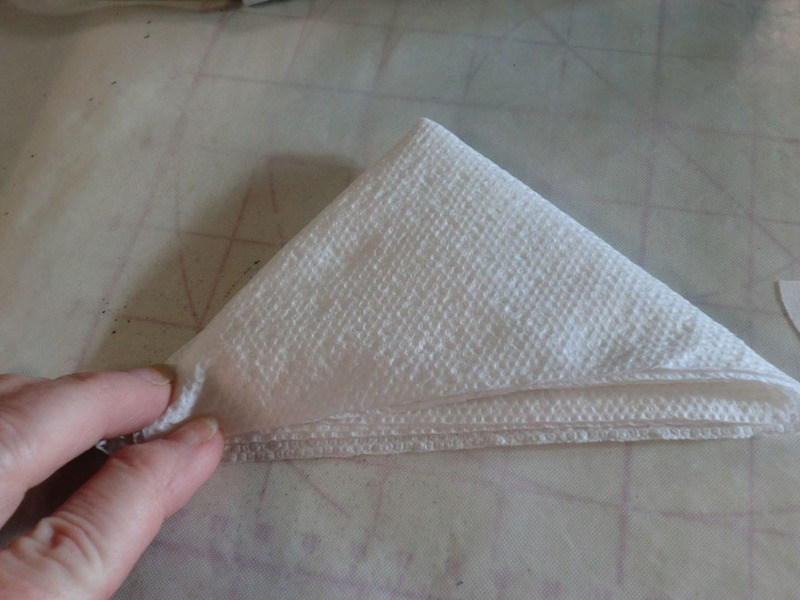 Fold the napkin in half on the diagonal and in half again. 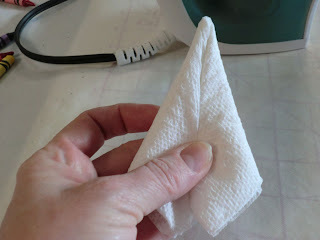 Fold the corners in to create a point. This is what your "paintbrush" should look like. Now to prepare the applique piece to color. Freehand draw or trace a shape of choice onto fusible web. 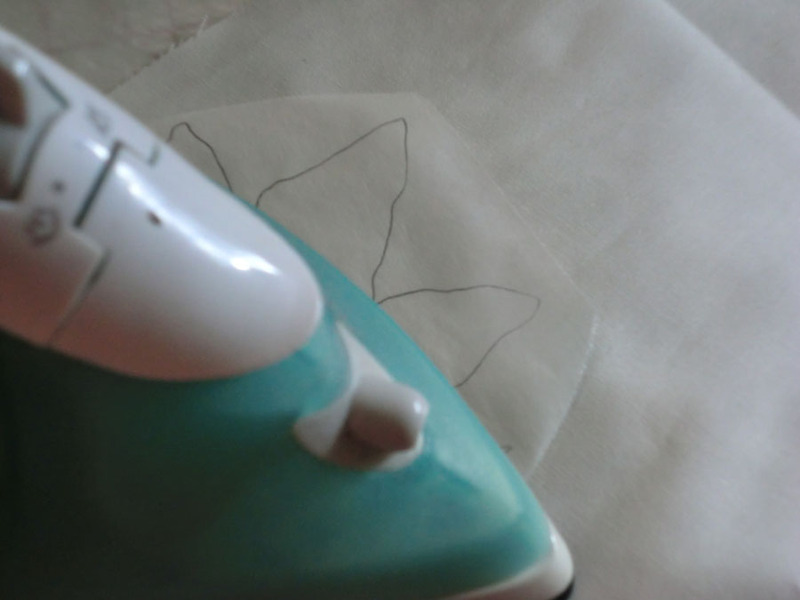 I used Steam-a-Seam 2 and Steam-a-Seam Lite and they both worked well. 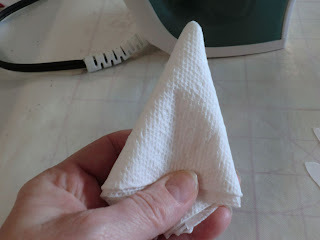 Fuse to white or light colored batik or other high thread count fabric, important because of the continuous rubbing while coloring. 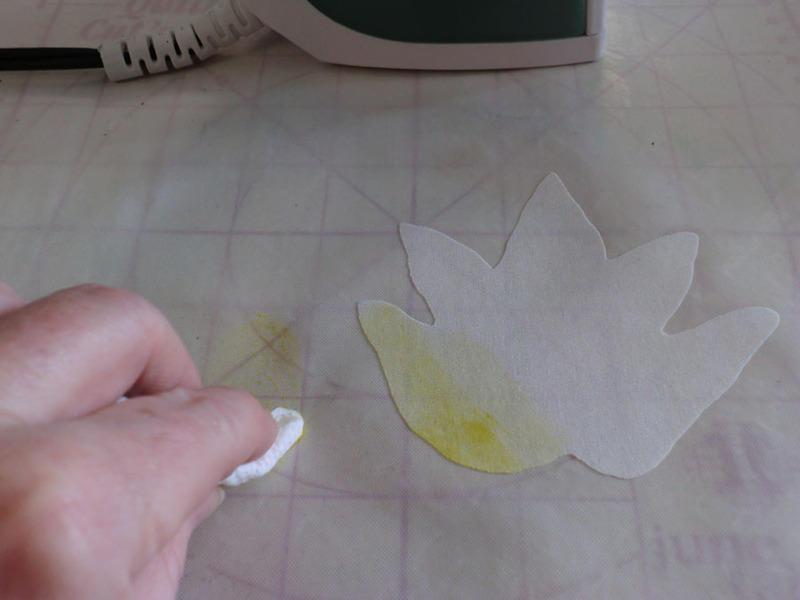 The applique shape needs to be fused to an applique pressing sheet, one that will be used throughout the process. 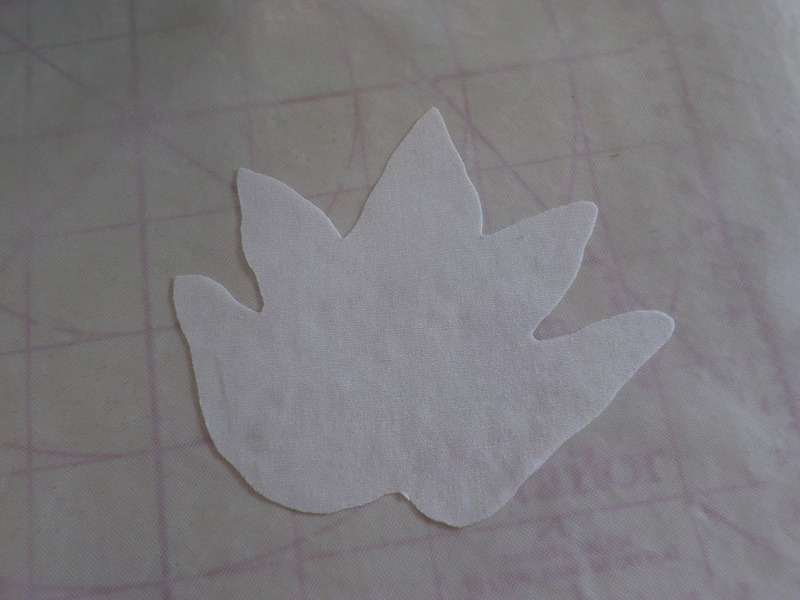 Once fused, cut shape out on drawn line. 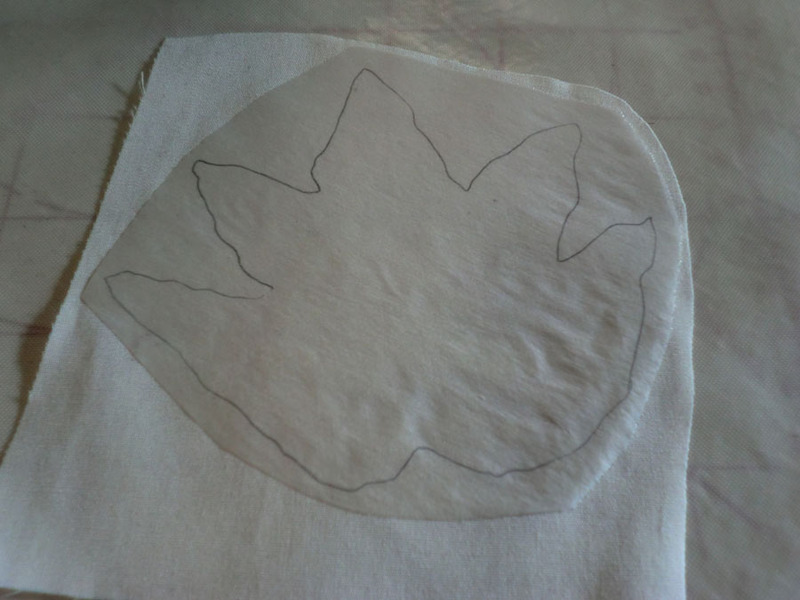 The applique shape is now ready to color. Crayola crayons are the recommended crayons. A box of 96 would be optimum (that includes metallics) but I had a box of only 24 which worked fine. 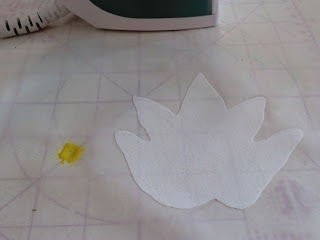 To melt the crayons and make the fabric able to take the crayon, heat the applique shape and applique pressing sheet. The heated applique pressing sheet will melt the crayon once placed on it. I melt a small dab as I'd rather have too little than too much. 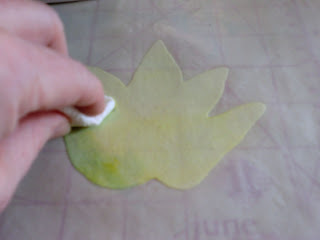 Dip the "paintbrush" tip into the melted crayon and begin coloring the heated applique shape. 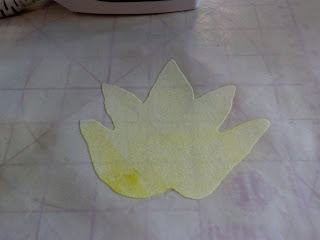 I began with yellow to use as the leaf base. 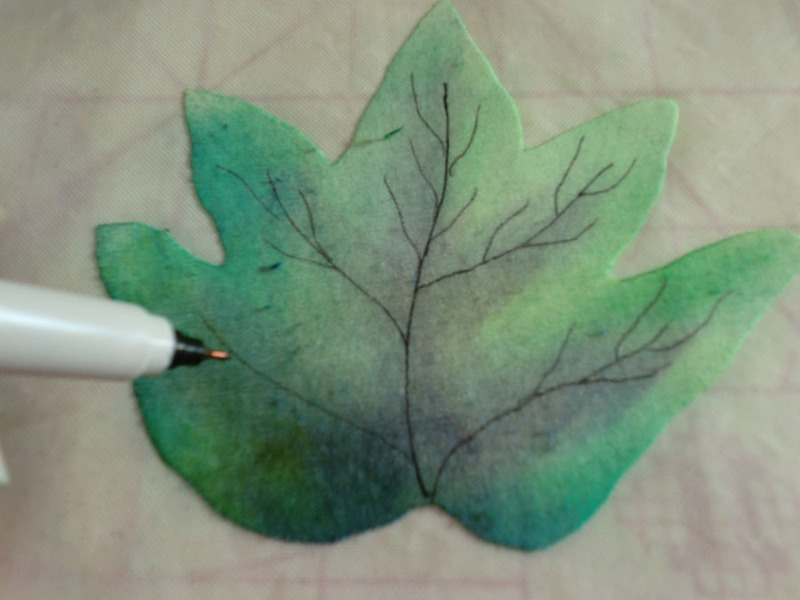 I begin by spreading the crayon a bit on the pressing sheet to spread it out and then apply to the fabric in a light circular motion. 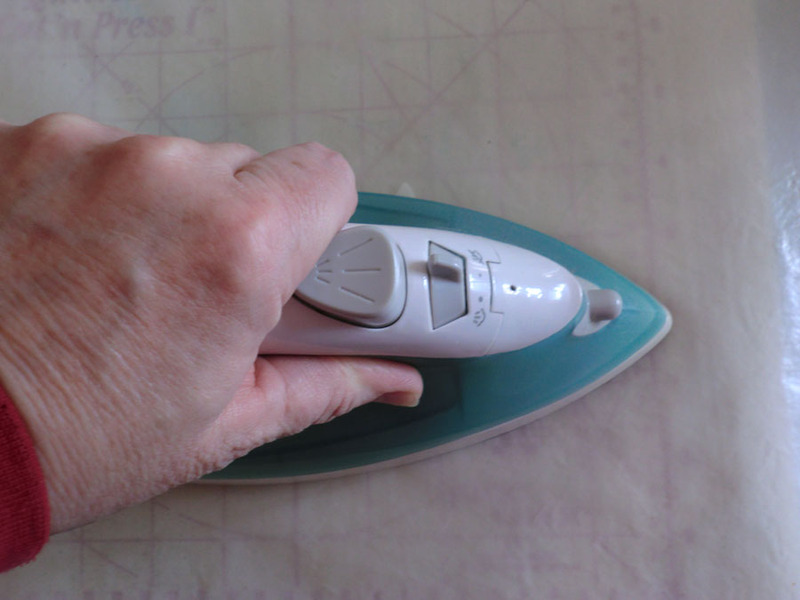 It may take a few tries, but a light hand is needed to get the blending results wanted. 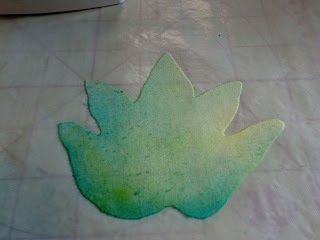 The base color is on. 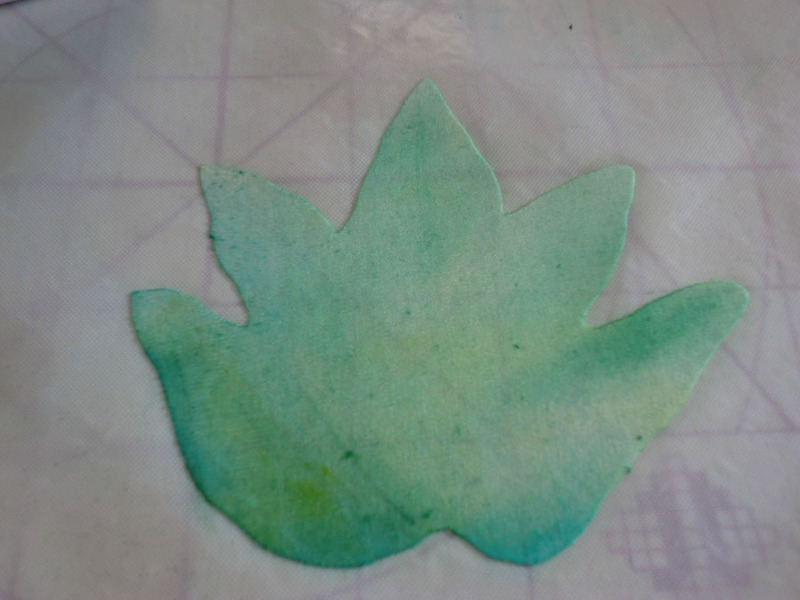 My next color of choice is blue green. Again, I heat the applique shape and pressing sheet to melt the crayon and color the fabric. I begin blending the blue green color over the yellow base. I leave some areas of the yellow showing. 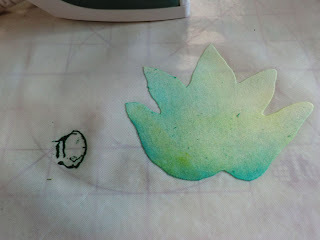 Once again the applique pressing sheet and applique shape are heated and a green crayon melted. The green is then blended in with the other colors. For some darker shading, I melted a purple crayon and shaded the center and. . .
... the inner portions of the leaf points. My leaf is now ready to have details added. Adding the details to the leaf are my favorite part of coloring. 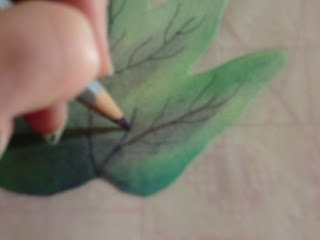 The supplies I used for this is an extra-fine point Sharpie, colored pencils, and a stencil brush. 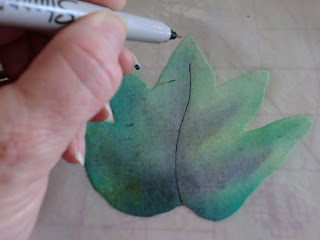 Beginning with the Sharpie, I draw the leaf veins. The veins are drawn and ready for the colored pencil. 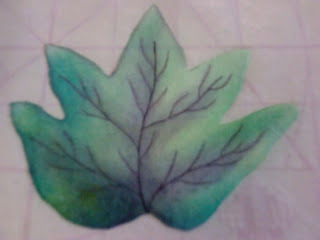 Using a purple colored pencil, I drew over the veins. 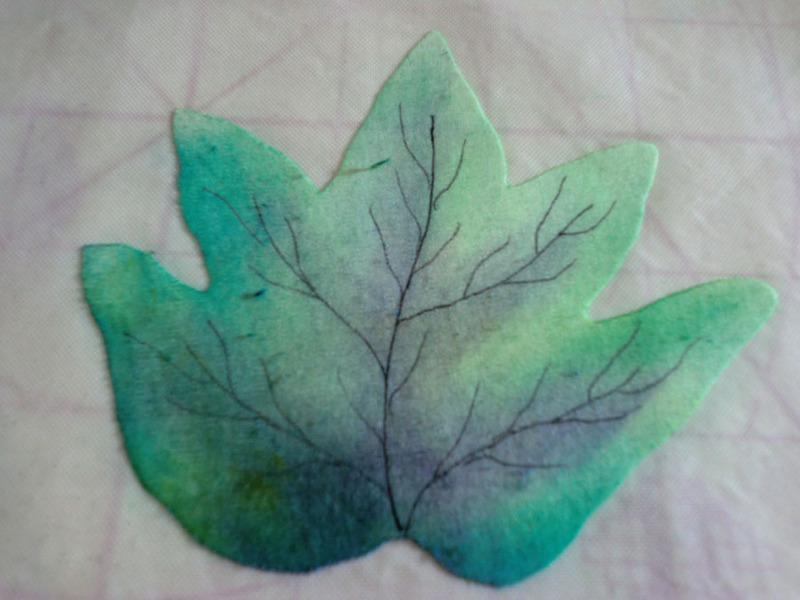 I then colored the leaf edges with the pencil. This leaf is only colored on one-half of the leaf so you can see the difference the pencil makes. After the pencil coloring is complete, a stencil brush is used to smooth the edges. 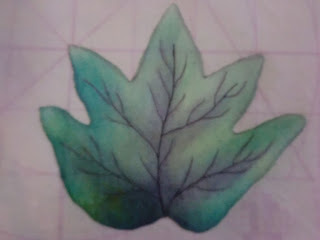 Here is the completed leaf, colored and detailed. And here are a few photos of work done by students in the workshop. These are bold and bright. 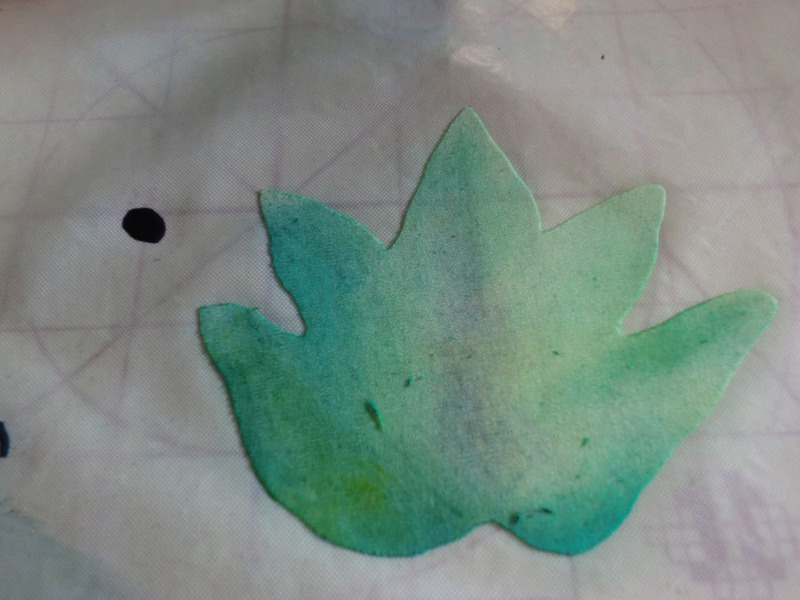 Although difficult to see, metallic crayons were used on these shapes. 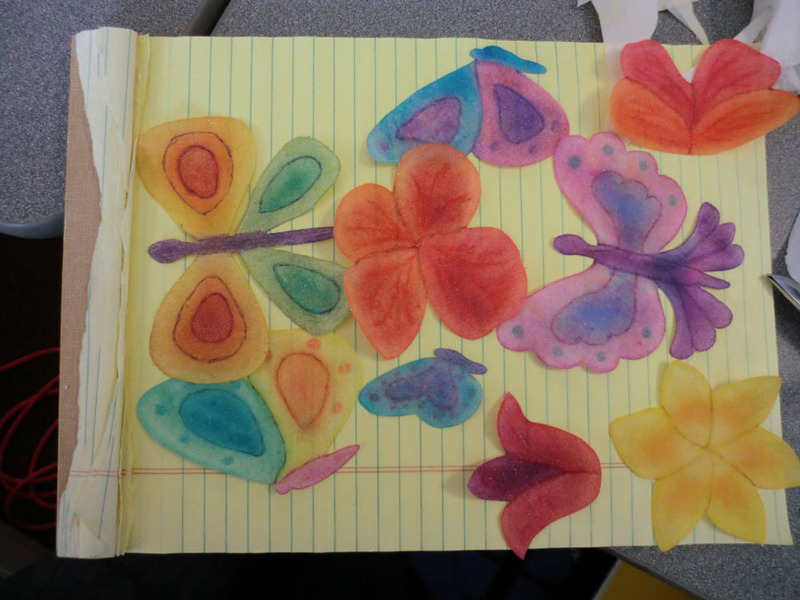 This student's coloring is soft and subtle. This student was able to get all the leaves completed for her intended project. And here are my leaves. I'm hoping I now have enough to make my project. This is an easy technique requiring a minimum amount of supplies. 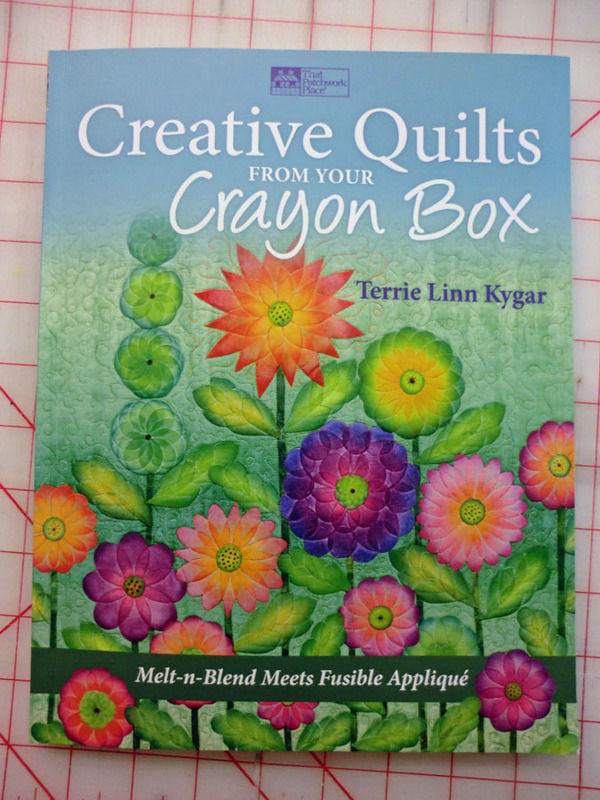 Get that crayon box sitting in a drawer out and see what art you can make. Hi Karri, and thank you so much for the instructions! Im new in your blog.I come from Spain but I live in Berlin. That its a great workshop, I tried soon.Thanks so much. 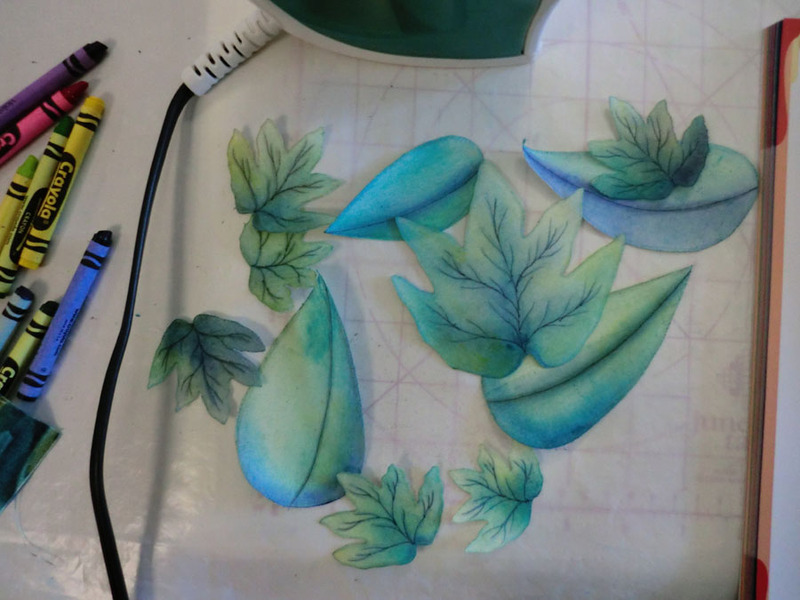 Your leaves are rocking COOL! My question....i plan on doing a funky garden and sewing a messenger bag and creating my garden on the front, how would i laundry this? 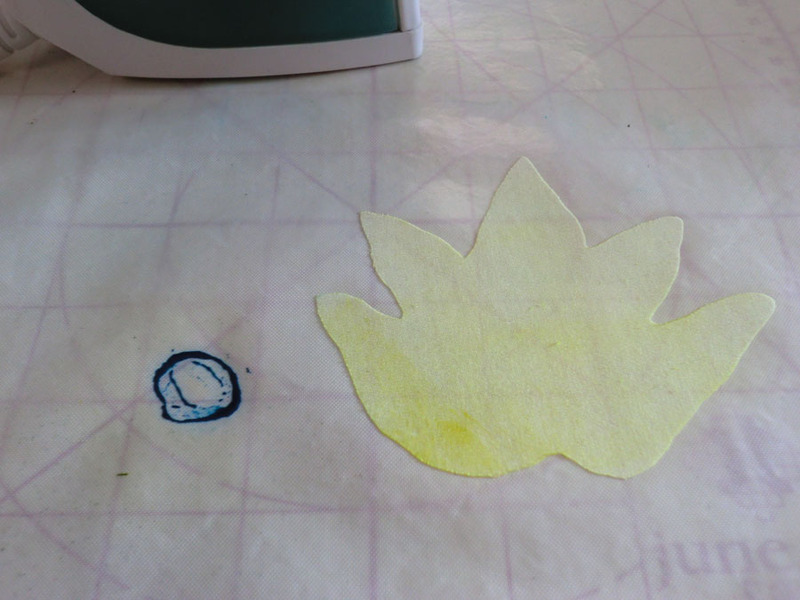 After the crayon is set, (which is done by taking a unfolded napkin, lay it over the picture and heat set)the picture is machine washable. Making Monogram Block for Mom's Quilt. 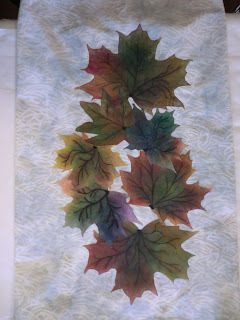 . .
Quilting Arts Challenge Update. . . Folded Log Cabin Class Photos. . .
Friday Finishes . . . I'm Finished!!!! Weekend Quilt Project. . . Twisted Fibers Friday begins. . .
Friday Finishes - Binding Basics. 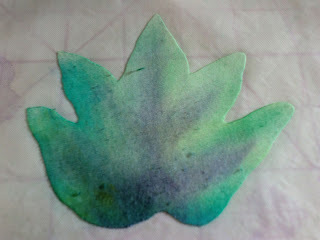 . .
Melting Crayons to Color Fabric. . .